Here I go with yet again another recipe post. My blog is quickly turning into a food blog. I just can't help it. I hope you guys aren't getting tired of the excessive amount of food I post. If you follow me on Instagram, I really am sorry. I promise some variety tomorrow, but this recipe had to be shared. I made this chicken salad Monday night for Sarah Beth's birthday. After a surprise visit from a friend, a couple other good friends came over and we sat around chatting while snacking on spicy Gouda and chips and salsa. I thought this would be the perfect light dinner after the loads of cheese and crackers we scarfed down. I found the recipe on The Pioneer Woman, but as usual adapted it a little. Most of the time when I adapt a recipe it is because I don't quite, have all the ingredients and I'm too lazy to go to the store. This adaptation actually makes it a little healthier, swapping out the mayonnaise and sour cream for Greek yogurt. Place chicken breasts into large plastic storage bag. Pound with a mallet or rolling pin to flatten to 1/4 inch uniform thickness (this was fun). Season chicken with salt and pepper. Heat grill and drizzle chicken with olive oil. Grill chicken on both sides until done, about 7 minutes per side. (Rotate halfway during grilling each side to ensure pretty grill marks.) Remove from pan. Allow to cool. With a very sharp knife, shave kernels off each corn cob. Combine with the onion and celery. Set aside. Mix together Greek yogurt, feta, and half-and-half. Stir in sugar, squeeze in lemon juice, and add salt and pepper. Stir, then taste. Add more salt if necessary; do not under salt! At the end, toss in the blueberries to lightly coat them in the dressing. Serve, then sprinkle individual helpings with feta. Slice chicken on the bias to create flat, randomly shaped pieces. Throw into a bowl with celery, onion, and corn. Stir to combine. Pour half the dressing over the ingredients and toss gently. Add more as desired, but don't overcoat the salad; should be light! **my adaptations: I used my panini press to grill the chicken and used frozen corn in replace of fresh corn. The chicken takes around 10 minutes to grill on the press. To give the frozen corn a fresh taste, I spread the frozen corn out on a baking sheet and toss with olive oil, salt, and pepper. Then throw it under the broil for 5 minutes, more on this method here. 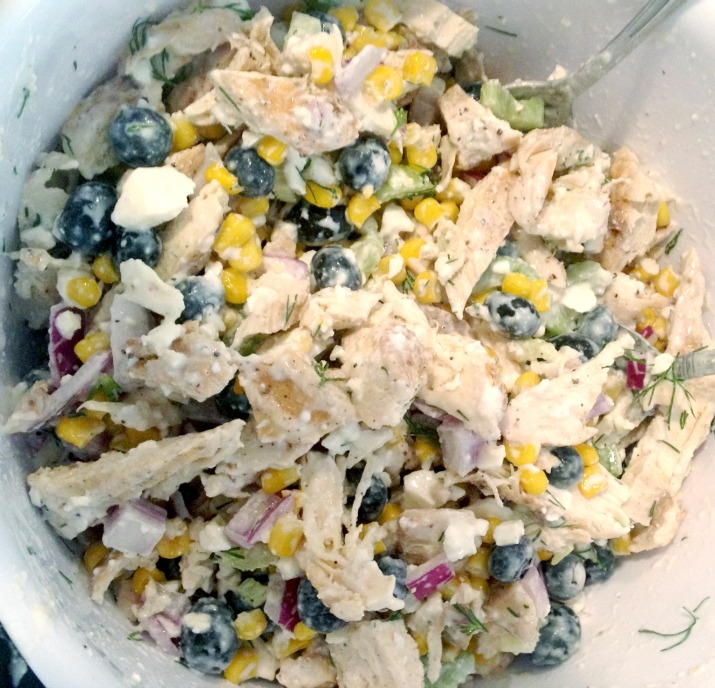 This chicken salad was definitely a crowd pleaser. It has great ingredients and is super fresh and colorful for summer! There's Popcorn in My Cookies!